Inexpensive all-rounder, capable of running games. 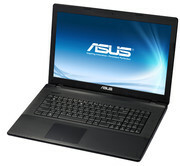 Asus is outfitting their 17.3-inch notebook with a Core i3 processor and the brand-new GeForce GT 720M GPU. Summed up, that means an inexpensive (450 to 500 Euros, ~$595 to ~$661) all-round notebook capable of running games. Our review reveals whether the computer really is a persuasive offer. A 17.3-inch notebook capable of running games - for less than 500 Euros (~$661) - isn't something we see every day. With the F75VC-TY088H, Asus has now incorporated just that into their product range. 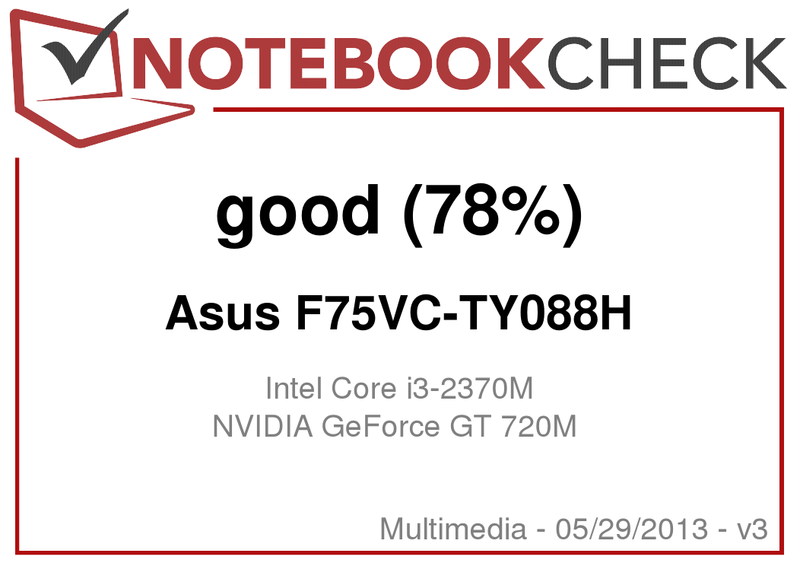 The notebook's construction is identical to that of the Asus F75A-TY089H (Pentium B980, HD Graphics) we just reviewed. 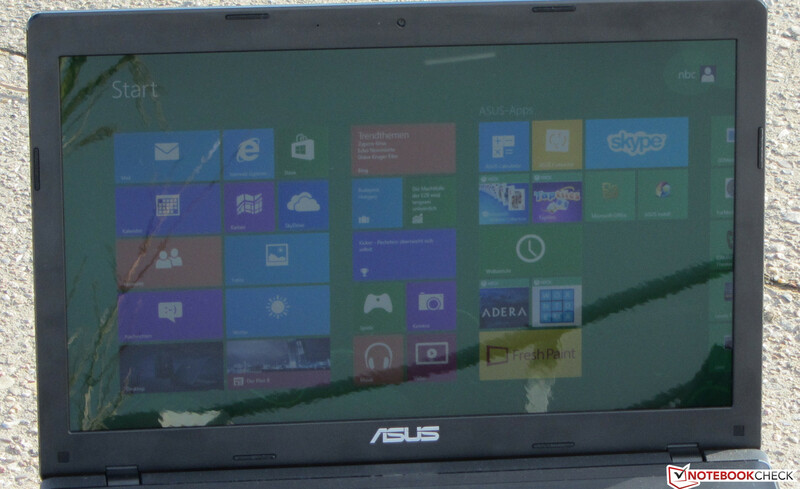 You'll discover in the review at hand whether Asus' F75VC is a device worth purchasing or not. To rate the computer, we'll be comparing it to these two competitors: The Samsung Series 3 355E7C-S05DE (AMD A8-4500M, AMD Radeon HD 7640G + HD 7670M Dual Graphics) and the Dell Inspiron 17R-5721 (Core i5-3317U, Radeon HD 8730M). 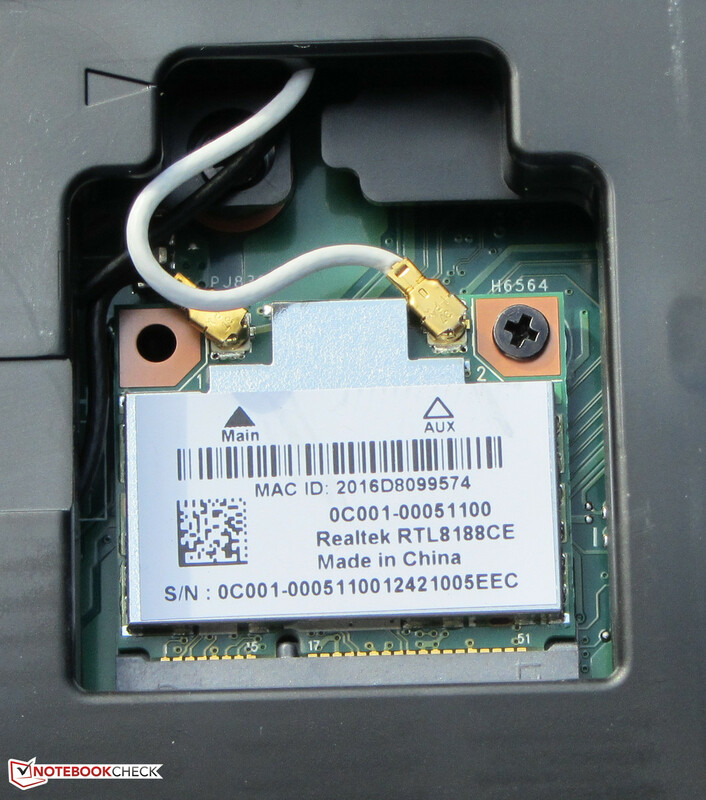 In terms of case, connectivity, input devices and speakers, our review device is identical to the F75A. Information about these components can be found in the corresponding review. Asus has also sold other variations of the F75A with different equipment under the series name X75A. Both series are built with the same case and the same motherboard. It's to be assumed that Asus will continue the same practice with the F75VC. As such, this review is also valid for X75VC models. The F75VC is equipped with the same Samsung display as the F75A, but the measurements of the two displays are a little different. Two identically constructed displays are never 100% alike. At 213.8 cd/m², the F75VC's average brightness ranks in the mid-range. Both the Samsung computer's display (244.7 cd/m²) and the Inspiron's (234 cd/m²) have much higher brightness values. The F75VC display's contrast (236:1) and black value (0.95 cd/m²) aren't good at all - in fact, they're even worse than the F75A's (291:1, 0.86 cd/m²). Even though the Inspiron (354:1, 0.69 cd/m²) and Samsung Series 3 (314:1, 0.78 cd/m²) displays have values superior to the F75VC, on the whole their numbers aren't stellar either. The F75VC's display doesn't cover the AdobeRGB or sRGB color spaces. We measured the display in its factory state (target color space sRGB) and detected marked DeltaE 2000 deviations from white, cyan and the grayscale. The deviations are more moderate for blue, magenta and red (DeltaE between 5 and 10). Only green and yellow are in the target area (DeltaE less than 5). The display suffers from a blue cast in its uncalibrated state. In theory, the brightness of the display should be sufficient for the content to be readable outdoors, but the low contrast and glossy surface make this a lot more difficult. Under direct sunshine the display content is hardly visible. 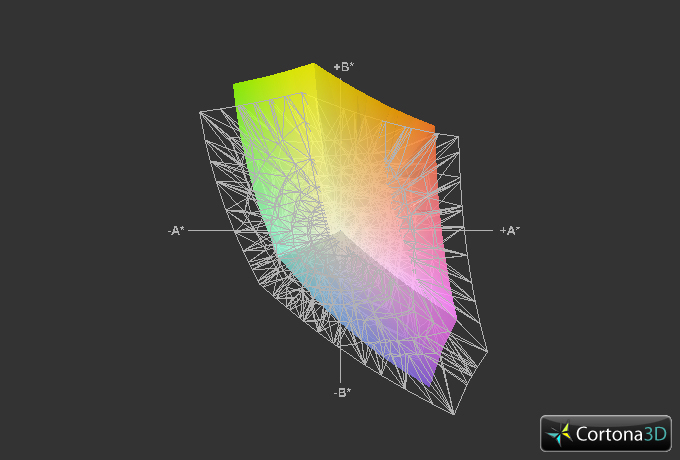 Changing the display's vertical viewing angle quickly leads to color inversion/loss. Things look better along the horizontal. The picture content is still readable from the side, though the display does darken somewhat. 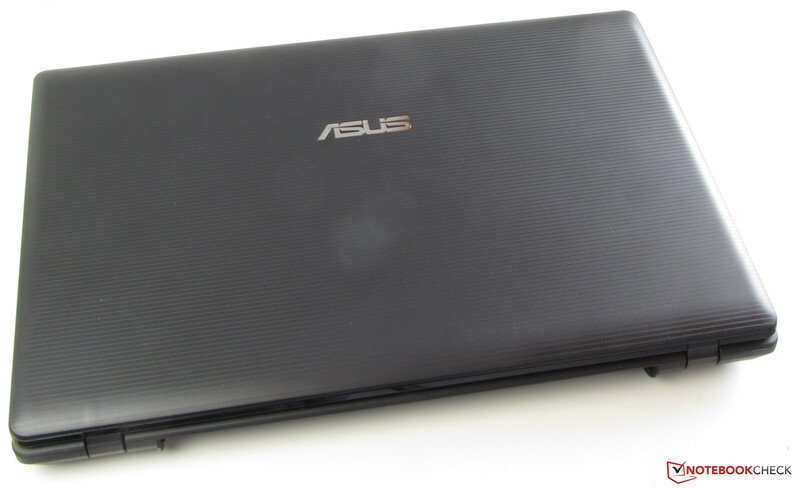 With the F75VC, Asus offers a 17.3-inch all-round notebook. Everyday applications like surfing the internet, word processing, internet communication and video playback are easy tasks for the installed hardware. With its GeForce graphics core, the notebook is also able to take on some current 3D computer games. Our review device is currently available for between 450 and 500 Euros (~$595 and ~$661). At the time of writing, a second model in the F75VC series is also on the market. That version is equipped with a Core i5-3210M processor. The rest of the components are identical. It costs between 500 and 550 Euros (~$661 and ~$727). It's to be assumed that Asus will also offer various other hardware configurations within their X75VC series. Some price search engines already list such models, but these are not available at this time. The F75VC runs on an Intel Core i3-2370M dual-core processor. This CPU is from the Sandy Bridge processor generation. It works at a speed of 2.4 GHz. There is no turbo. This is a conventional mobile CPU with a TDP of 35 watts. The processor runs the Cinebench benchmarks at full speed. The results from the CPU tests are lower than the Inspiron's (Core i5-3317U, Radeon HD 8730M) - even though both CPUs run at the same speed. There are two reasons for that: The Inspiron's Core i5 processor is based on the Ivy Bridge architecture and computes about 5% faster than a Sandy Bridge model running at the same speed. Additionally, the Inspiron is outfitted with two working memory modules. 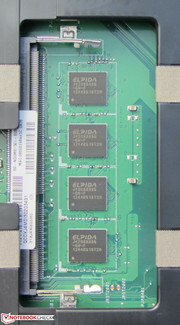 The CPU profits from their work in dual-channel mode. The Samsung computer (AMD A8-4500M, Radeon HD 7640G + HD 7670M) lies a good distance behind the other two competitors because it has the weakest CPU. In the Cinebench R11.5 GL test, the F75VC has to forfeit to its two competitors. In the Cinebench 10 GL tests, our review device positions itself between the Inspiron and the Aspire. The system runs fluidly. Starting and shutting down Windows 8 are the only processes that take some time. The result from the PC Mark 7 benchmark lies within a good range. The Inspiron (Core i5-3317U, Radeon HD 8730M) does better here. The Inspiron is able to achieve a better result because it has a faster hard drive and memory modules working in dual-channel mode. The Samsung notebook (AMD A8-4500M, Radeon HD 7640G + HD 7670M) comes in behind the other two competitors. 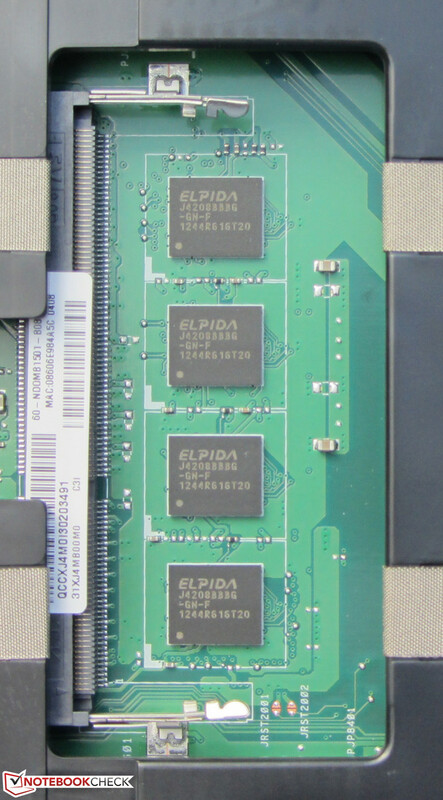 For testing purposes, we installed an additional working memory module in our review device so that the working memory could function in dual-channel mode. This helps the CPU to come closer to reaching its maximum potential. The computer's result in the PC Mark 7 benchmark rose by about 8% to 2304 points. We saw an enormous increase in speed when we installed an old Solid State Drive (Crucial RealSSD C300 - 64 GB). We did a fresh install of Windows 8 on the SSD and then ran the two PC Mark benchmarks again. The results rose by about 68% to 3586 points (PC Mark 7) and about 97% to 9619 points (PC Mark Vantage). Investing in an SSD for this Asus computer would certainly pay off. One must assume that the benchmark results would rise even higher with the installation of a current SSD (for example the Samsung SSD 840). The F75VC is equipped with a hard drive from Hitachi's Travelstar Z5K500 series. 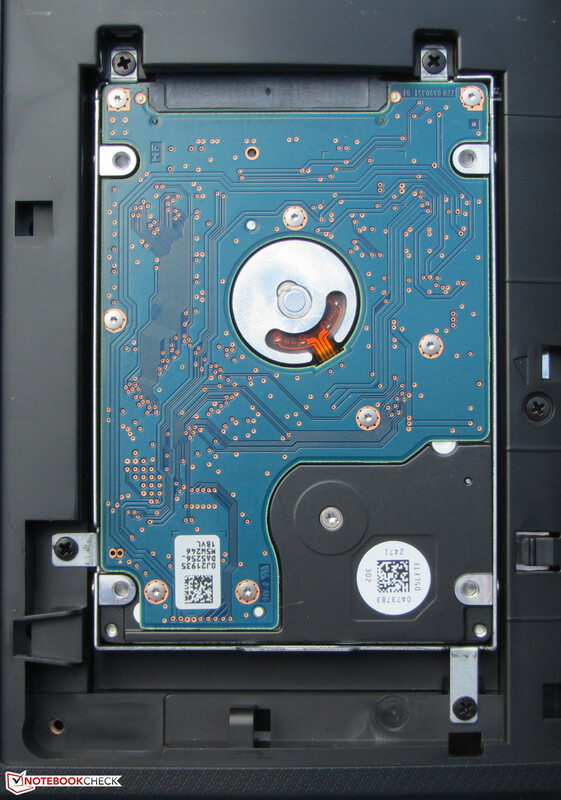 The drive has a capacity of 500 GB and runs at 5400 revolutions per minute. As per usual for Asus, the notebook's hard drive is divided into an operating system partition (186 GB), a data partition (258 GB) and a recovery partition (20 GB). CrystalDiskMark records a read speed of 83.55 MB/s. HD Tune shows an average transfer rate of 79.8 MB/s. These are good numbers for a 5400 rpm hard drive. However, at 22.1 ms the drive's access time is too slow. The 4k read value is also very low. The computer's graphics equipment consists of an Intel HD Graphics 3000 GPU and Nvidia's new GeForce GT 720M graphics core. The notebook uses Intel's GPU for everyday tasks. The GeForce GPU kicks in to run complex applications like 3D computer games (thanks to Optimus). The GT 720M is a lower middle class GPU and supports Direct X 11. It runs at a base speed of 625 MHz. Using turbo, the speed can be increased up to 938 MHz. The main difference between this GPU and its predecessor - the GeForce GT 620M - also lies in its speed. 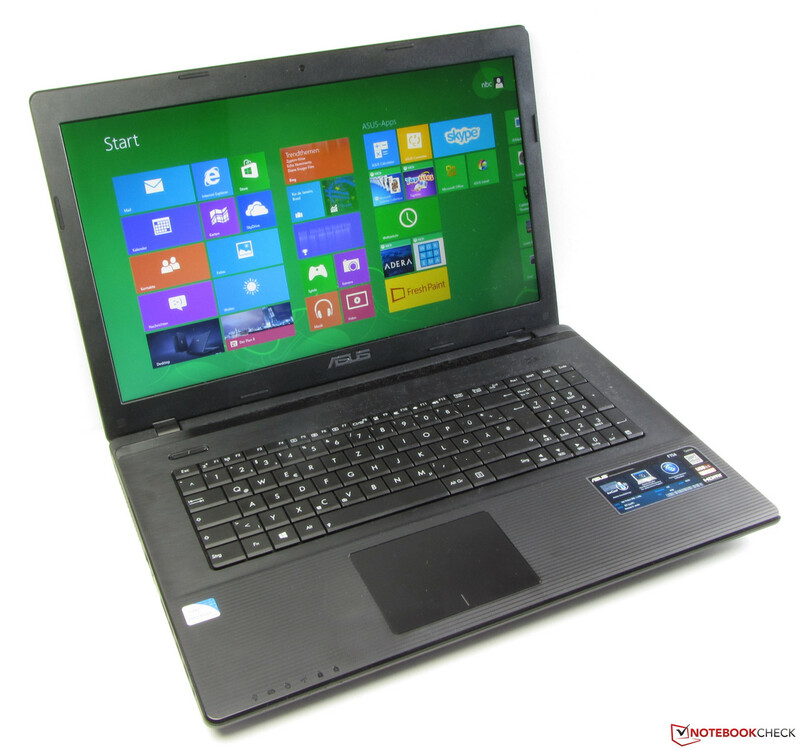 The GT 620M also runs at a base speed of 625 MHz, but its turbo speed only reaches 715 MHz. In the various 3DMark benchmarks, the F75VC is beaten by the Samsung computer (AMD A8-4500M, AMD Radeon HD 7640G + HD 7670M Dual Graphics) and the Inspiron (Core i5-3317U, Radeon HD 8730M). Both notebooks are equipped with stronger GPUs and achieve better results. Compared to the GeForce GT 620M GPU, the GeForce GT 720M yields a 20 to 25% better result in the 3DMark 11 benchmark. That corresponds closely to the speed difference between the two GPUs. 3DMark 11 is well-suited to compare these two GPUs, since CPU performance hardly influences the result. 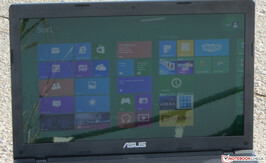 The Core i3 processor and GeForce GT 720M graphics core enable the notebook to run most current computer games at medium quality settings with a resolution of 1366x768 pixels. Some games play fluidly at high quality settings as well. In some rare cases it's possible to run a game at Full HD resolution - for instance FIFA 13. The games Risen 2, Crysis 3 and Metro: Last Lights don't reach playable frame rates. Dishonored refused to play on our test device. Due to its higher turbo speed, the GT 720M core is capable of generating higher frame rates than its predecessor (GeForce GT 620M). The 720M is on par with the GeForce GT 630M GPU in this area. Anyone looking for better gaming performance should fix their eyes on other notebooks. The Inspiron 17R is the only immediate competitor to offer a little more gaming performance - and not even in all games. In some games it performs worse than the F75VC - for instance in Hitman: Absolution. The Acer Aspire V3-771G (Core i7-3630QM, GeForce GT 650M, IPS display with Full HD resolution) offers considerably higher gaming performance than any of our three competitors. The version we reviewed costs about 1000 Euros (~$1321), but the device is also available in a slimmed-down version with a Core i5-3230M processor and standard display (1600x900 pixels) for under 600 Euros (~$793). In idle mode, the F75VC runs quietly. We measure a sound pressure level of 30.5 to 30.9 dB. The Inspiron (32 to 32.4 dB) and the Samsung computer (30.8 to 34.4 dB) can't quite keep up with those numbers. Under medium load (3DMark06 running) and full load (stress test, Prime95 and Furmark running), the F75VC generates more noise. We measure 38.9 and 41.3 dB respectively. The Samsung computer (36.1 and 38.7 dB) does its job a little more quietly. The Inspiron (36.4 and 42.1 dB) is quieter than the Asus notebook under medium load but louder under full load. The Asus F75VC in the stress test. In idle mode, the F75VC's case barely warms up at all. We measure temperatures less than 30 °C (86 °F), without exception. Both the Inspiron and the Samsung computers warm up more. Under full load, the Asus notebook's temperatures rise moderately to 26.6 to 45.6 °C (79.9 to 114.1 °F). The 45.6 °C measurement was taken on the underside of the notebook around the height of the cooler. Nowhere else does the temperature rise above 40 °C (104 °F). The Samsung computer's temperatures are on par with those of the F75VC. The Inspiron's case warms up somewhat more. 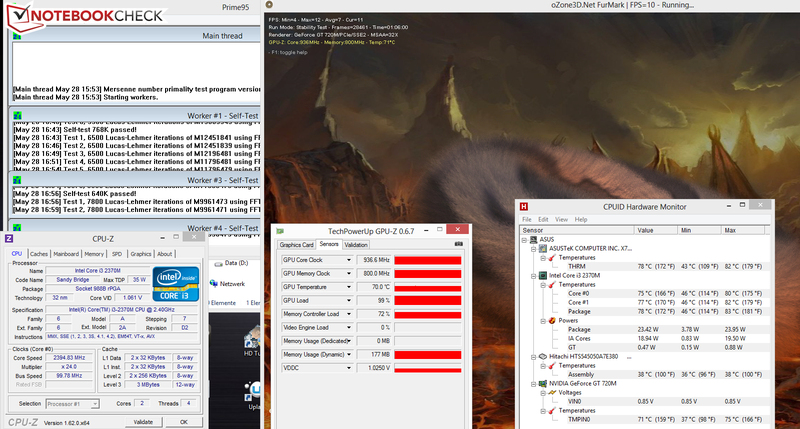 The CPU and GPU run the stress test (Prime95 and Furmark running for at least an hour) at full speed in both AC power and battery mode (CPU: 2.4 GHz, GPU: 938 MHz). The CPU temperature levels off at about 78 °C (172.4 °F) in AC power mode. In idle mode, we measure a power draw of between 8.3 and 12.9 watts. Both the Inspiron (13.1 to 18.2 watts) and the Samsung Series 3 (11.6 to 17.1 watts) consume much more energy here. 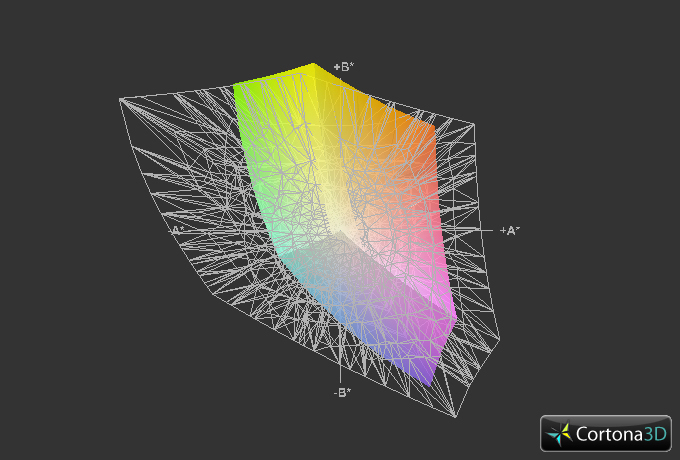 Under medium load (3DMark06 running) and full load the picture is reversed. The F75VC eats up 57.1 and 69.7 watts respectively. The Inspiron (41.6 and 51.2 watts) and the Samsung computer (54.5 watts) consume less. This is unsurprising, since the Inspiron is equipped with an economical ULV processor, and the Samsung notebook doesn't run at full speed under load (throttling). The F75VC reaches a runtime of 6:56 h in idle mode. Here our test device greatly surpasses the Samsung computer (4:22 h) and the Inspiron (5:16 h). 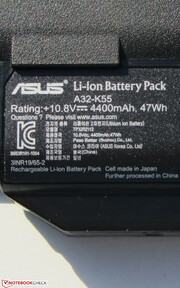 The battery's runtime in idle mode is determined using the Battery Eater Reader's test. The display is dialed down to the lowest brightness setting, the energy-saving profile is active and the wireless modules are turned off. Under load the Asus notebook runs for 1:17 h. The Samsung computer peters out just a little earlier at 1:11 h. The Inspiron's battery proves to last much longer (2:15 h). We calculate battery life under load using the Battery Eater Classic test. 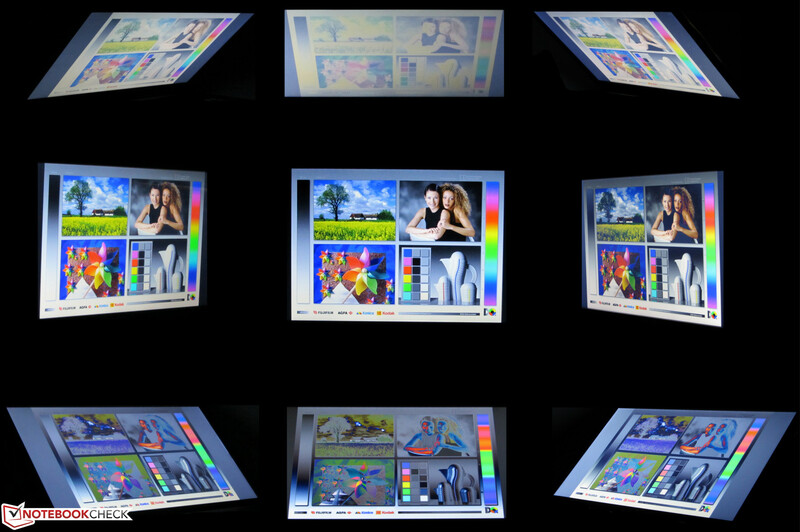 Here the display is set to full brightness, and the high-performance profile and wireless modules are active. The WLAN test is over for the F75VC after 3:49 h. The Inspiron (4:01) only chugs on a short while longer. The Samsung notebook (2:35 h) doesn't even cross the three-hour mark. In the WLAN test websites are automatically loaded at 40 second intervals. The energy-saving profile is active, and the display brightness is set to 150 cd/m². DVD playback ends after 3:01 h. Once again, the Inspiron (2:57 h) is on par with the Asus notebook. The Samsung computer comes in behind the other two competitors. 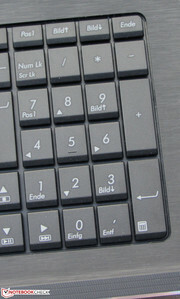 The DVD test runs with the energy-saving profile activated (or a higher profile if the DVD doesn't play fluidly), display brightness set to maximum, and the wireless modules turned off. If you compare the three competitors' battery lives with their battery capacities, the F75VC is the clear winner. It reaches considerably longer runtimes than the Samsung computer, even though their capacities are almost identical (Asus: 47 Wh, Samsung: 48 Wh). The Inspiron's runtimes are disappointing; it's equipped with a ULV processor and a large-capacity battery (65 Wh), yet it can only set itself apart from the Asus notebook under full load. 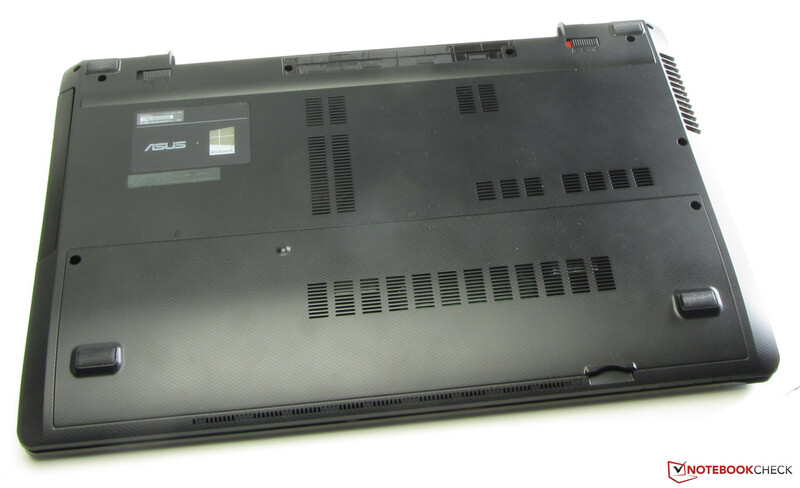 The Asus F75VC-TY088H scores points for its good application performance and quiet operation - at least in idle mode. The computer's temperatures are reasonably low as well. Anyone who likes to play a computer game here and there can do so, thanks to the GeForce GPU. The battery runtimes are also respectable. We like the 24-month warranty too. But, like so many inexpensive notebooks, the F75VC is equipped with a weak display. 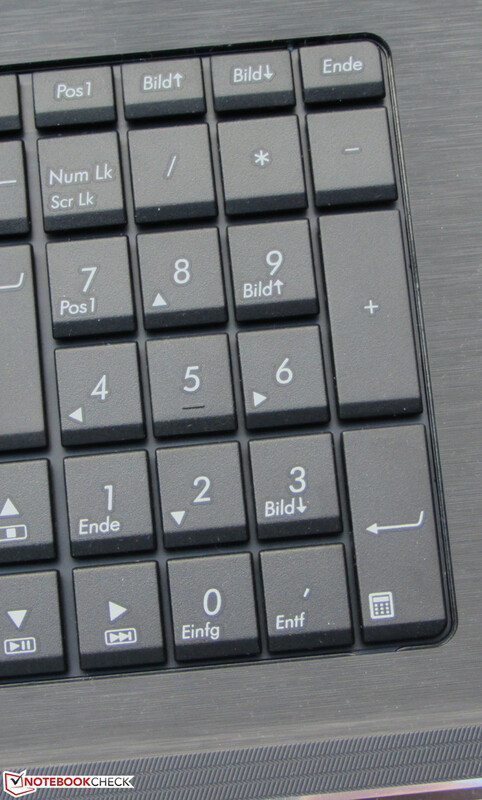 The keyboard is not the best of its kind; it rocks noticeably during typing. Those who type a lot will quickly find themselves displeased with Asus' keyboard. The Samsung Series 3 355E7C-S05DE is a possible alternative if you're looking for a matte display and a better keyboard. The Dell Inspiron 17R is an interesting option for anyone who'd like a little more gaming performance and a more high-quality case. Additionally, as is usually the case for Dell computers, the individual buyer has a lot of freedom to select which particular hardware components they want installed in their system. 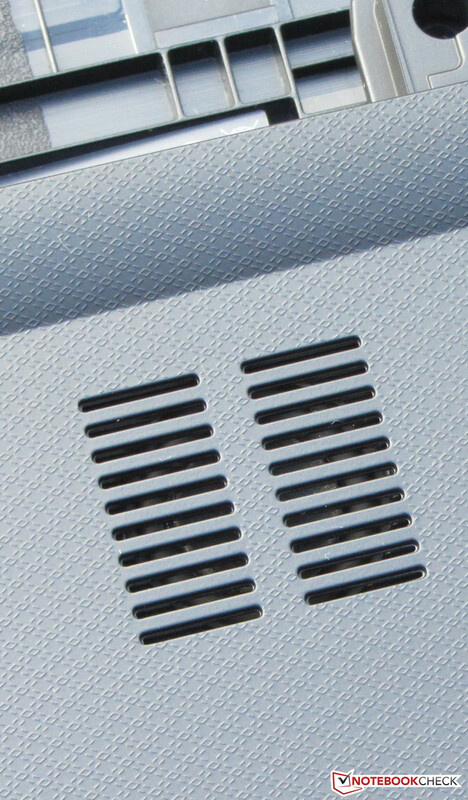 The ribbed surface of the backside of the lid helps with traction. A number block is also accounted for. 4 GB of working memory is soldered to the motherboard. There is a free memory bank available. 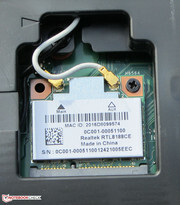 Two WLAN antennae are installed in the notebook. ...and has a storage capacity of 47 Wh. 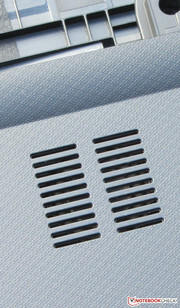 The speakers are located on the underside of the computer. The good application performance and 24-month warranty. A higher-contrast display and a better keyboard. Asus builds good sounding speakers into an inexpensive notebook. You don't see that every day. A two-year warranty for an inexpensive all-round notebook isn't all that common either. Samsung Series 3 355E7C-S05DE, Dell Inspiron 17R-5721, Toshiba Satellite L875D-10E, Asus K75DE, Acer Aspire V3-771G, Sony Vaio SV-E1712F1EW, Asus K75VJ-TY102H, HP ProBook 4740s, Lenovo IdeaPad G780, HP Pavilion g7-2007sg.